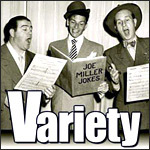 The definitive public-service radio series of the postwar era, Guest Star was a long-running showcase for favorites from every field of American popular entertainment (and a consistent sales pitch for U. S. Savings Bonds). An outgrowth of the Treasury Department's various wartime programs, the series catch-all variety format allowed for comedy, music, dramatic sketches, and any other type of act that could fit into a fifteen-minute time slot...with time out for a discussion of the Payroll Savings Plan. Running from the late 1940s to the early 1970s, Guest Star was a constant presence in early-morning or late-night time slots, especially over small-market independent stations with a need for a cost-free way to fill their obligatory public-service air time.